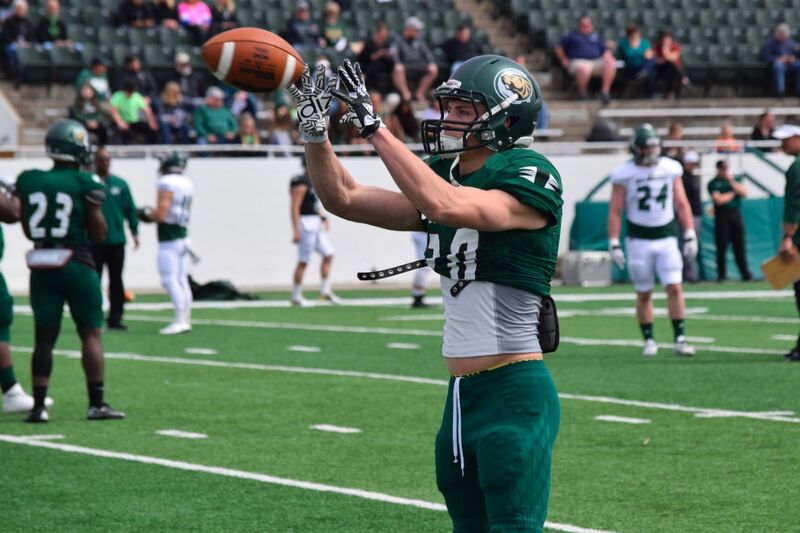 The 2018 Bemidji State University football program announced the rescheduled Green and White spring game as well as its annual youth camp. The annual Green and White football spring game is now scheduled for 2:30-4 p.m. Sunday, April 15 while the youth camp is scheduled to take place from 10 a.m. – 12:30 p.m. Saturday, April 21, both held at Chet Anderson Stadium in Bemidji, Minn. Weather conditions pushed the Green and White football spring game back one day after originally being scheduled for Saturday, April 14. All spring game activities will begin at 2:30 p.m. and will run until approximately 4 p.m.
Bemidji State coaches and current student-athletes will be on-hand Saturday, April 21 for the annual youth camp with registration set for 10 a.m. and is scheduled to begin at 11 a.m. from Chet Anderson Stadium. Lunch will be provided along with autographs from student-athletes at 12 p.m. before the end of camp. To register for the camp, please click on the link provided to the right of this page. For a copy of the official Green and White Spring Game program, click the link to the right of this page. The program includes a roster for the spring game along with a recap of the 2017 schedule and a preview of the 2018 season, which includes six home games at Chet Anderson Stadium.